Harriet the Spy was published in the fall of 1964, following several months of meetings and mentoring with Nordstrom and Zolotow. Nordstrom’s correspondence reveals a variety of marketing strategies. They sent the manuscript or advance copies to reviewers as well as to established writers. A good quote from the poet and children’s writer Phyllis McGinley was used in advertising. Nordstrom herself said, “I do not dote on Miss McGinley” (177)–hardly surprising, since McGinley’s stories are remembered for celebrating domestic, suburban life–but “[e]veryone thinks the McGinley quote sells, so that’s why it was used” (179). In addition, the writer of this article notes, paperback for children are hard to find. The packages he recommends are a set for girls ages 7-12, which includes Harriet the Spy (and its sequel The Long Secret) and a similar set for boys. This kind of marketing shows that Harper & Row already perceived Harriet as a book with legs: one that would become part of the basic reading library for girls in particular. This image shows the character of Harriet, the lone girl in a pantheon of men and male animals, each representing a character from a canonical children’s book. This image elevates Harriet to new heights. While the image is clearly an advertising ploy, it would not be a particularly effective one if it didn’t ring true with many readers. 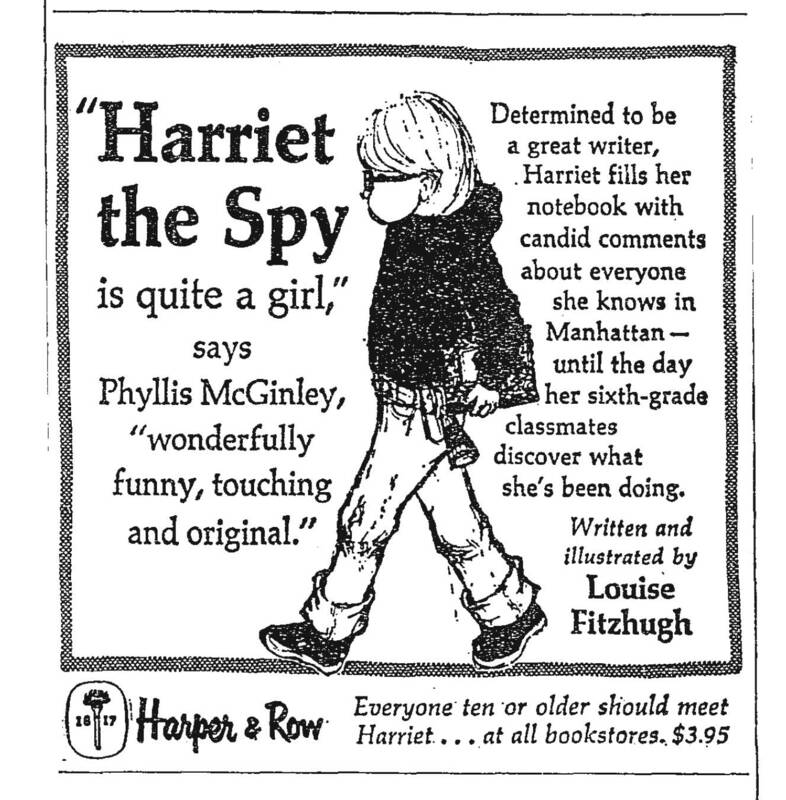 Harriet the Spy was firmly entrenched as a modern classic. Charlotte Zolotow’s instinct and Ursula Nordstrom’s editorial patience and cunning had paid off again, and Harper & Row must have been delighted with the results. 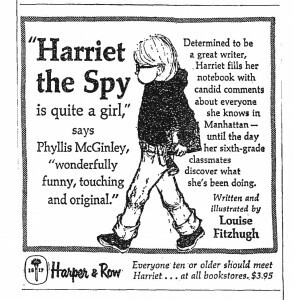 These advertisements also show how crucial the images were to the success of Harriet the Spy. Most of the drawings in the book are character sketches, showing a person or a group of people in a pose typical of them, with little or no background. Only Harriet is seen in a clear context: walking a city street, clinging to a window ledge to peer in, crouched in a dumbwaiter listening, and in a bath after an incident in which she was covered with paint. Amazingly, Harriet’s facial features are drawn in less detail than anyone else pictured. She in normally shown from the side or back. She is only shown from the front in the bath, with her face covered with ink, and in the dumbwaiter, in which her face forms a tiny part of the whole picture, which includes the entire dumbwaiter apparatus. The image we have of Harriet is entirely made up of iconography: the jeans with turned-up hems, the red hoodie, the notebook under her arm or being scribbled in, and the horn-rimmed glasses she wears while on her spy route to look more intellectual. The illustrations thus back up the text’s point of view. Where secondary characters are acutely observed, Harriet has to be understood from the inside out. Harper & Row advertisement, New York Times Nov. 2, 1964: 37. Walters, Raymond, Jr. “Paperback Parcels.” New York Times Dec. 1, 1968: BR103. Dell advertisement, New York Times Nov. 8, 1970: 341.
the most amazin book eva!